When Tina and her husband decided to visit the Lincoln showroom, they were impressed by the efficient service they received. “The showroom was nicely laid out with lots to see,” said Tina. “We didn’t have an appointment but a designer saw us immediately.” The Wildings came armed with their kitchen measurements and explained what they had in mind. They credit the designer for using her experience and knowledge to help them create the perfect kitchen in their 19ft 6 by 9ft 4 space. 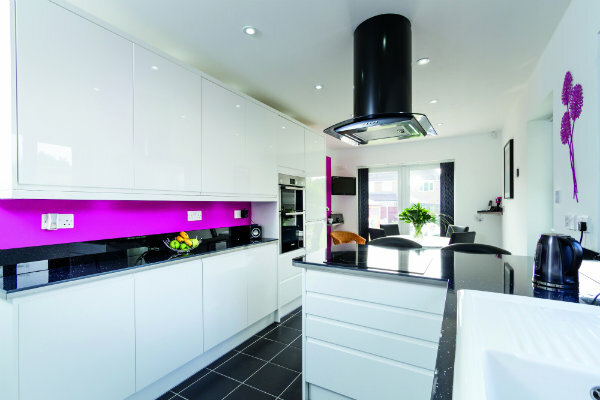 The Wildings bought 12 Handleless White Gloss units from Wren, complete with a black sparkly worktop, a breakfast bar and white ceramic sink. They also got the fridge freezer, induction hob and double oven from Wren. From start to finish in four weeks! 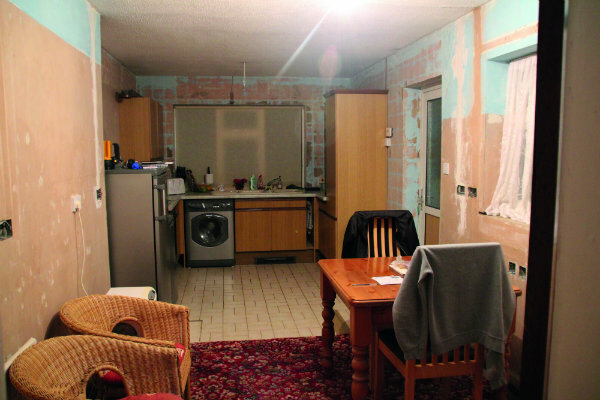 The couple planned to fit the kitchen themselves but were happy to discover that they could get Wren to do one of the trickier parts and fit the work surfaces. “Being expensive, we didn’t feel comfortable doing it,” admitted Tina. 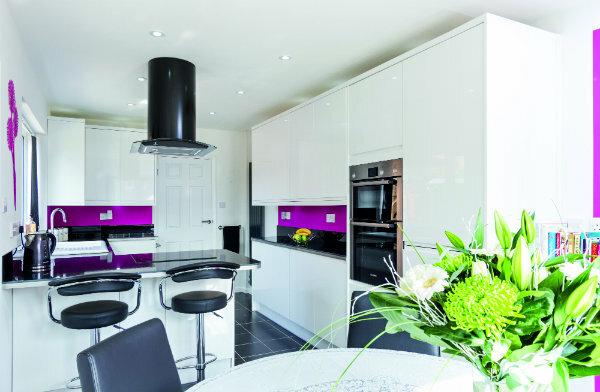 “And I’m glad we asked Wren because the fitter did an excellent job!” The Wildings had their kitchen delivered, fully assembled and fitted within four weeks, and their designer kept in touch with them along the way. 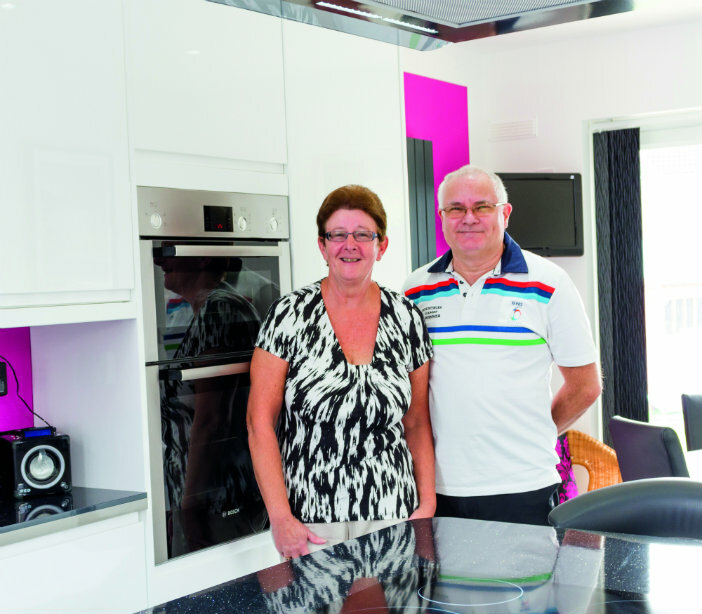 The couple are thrilled with their new kitchen and are pleased with the Handleless design, which they say is easy to use and maintain. 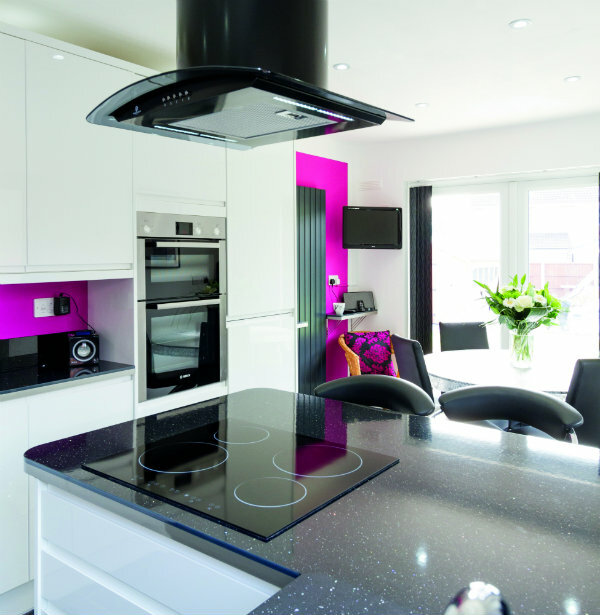 Tina finished off her kitchen with black ceramic tiles and a feature wall in cerise. “It’s fabulous,” beamed Tina. Small and dingy turned light, bright and beautiful! You can view the same range here and see how it can work in the space you have at home.